We are pleased to announce that beginning today, the LaserFit 2000(tm) bike fitting system is available at all three of our stores. The LaserFit 2000(tm) ushers in a new era of personalized service and customization. For a nominal fee of $250, you will spend a relaxing 10 minutes in the comforting cocoon of the LaserFit 2000(tm), bathed in refreshing jets of water from the Cuyahoga River and the soothing melodies of Kenny G, while an array of "laser" beams scans every contour of your body, measuring and recording every dimension. This data is then transmitted via our state-of-the-art 4G network to our top-secret custom frame-building facility. In the space of a few short months, you'll have your one-of-a-kind, custom-fitted, custom-made bicycle ready to ride! 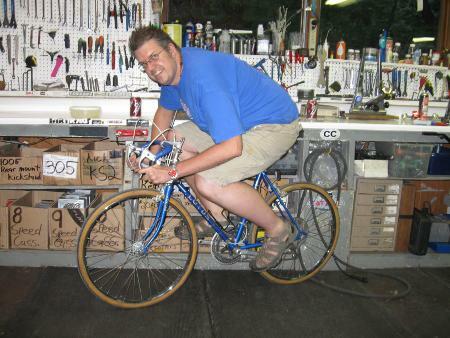 Here's Rich, mechanic from our Peninsula store, on his new road bike. As you can see, the LaserFit 2000(tm) perfectly designed a bike to fit all 6-feet 5-inches of him! Stop in today for your LaserFit 2000(tm) session! My Becky wants her Masi customized with your Super Duper laser system. Hi Becky!